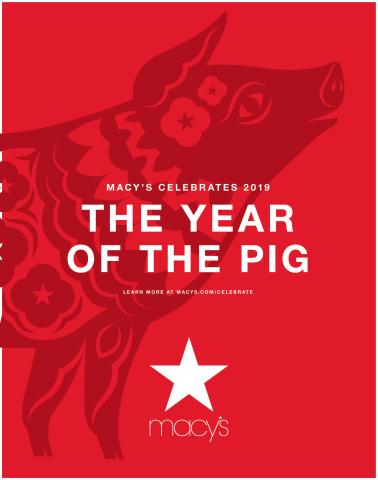 NEW YORK--(BUSINESS WIRE)-- Beginning January 31 through February 23, Macy’s will celebrate the New Year, good fortune and the “Year of the Pig” with a wide array of musical and artistic performances, in-store visuals, commemorative product, cooking demos, and giveaways at select stores nationwide in celebration of Lunar New Year. In celebration of Lunar New Year, in-store events will take place at select Macy’s across the country including New York, California and Hawaii. These festivities will feature lucky money walls and trees, traditional Chinese cuisine, Lion Dance performances and kung fu demonstrations, in-store giveaways, and more. Lunar New Year festivities at Macy’s will also include tourism outreach with exclusive savings for travelers visiting from China during the holiday. For more information travelers can go to visitmacysusa.com. Macy’s is proud to offer a variety of Lunar New Year-themed and specially created holiday products at select stores and online at macys.com/celebrate. Macy's has gifts for everyone on your Lunar New Year shopping list including cosmetics and fragrances, handbags, spectacular dresses, and stunning jewelry. M.A.C. recently rolled out a limited-edition line of red lipsticks to celebrate Lunar New Year, so customers can dress up their favorite reds in festive, metallic red tubes with floral imprints. Kipling and Radley London have also created limited-edition clutches and handbags in the traditional red for customers celebrating Lunar New Year. Or, let the recipient pick their perfect item with a commemorative Macy’s Lunar New Year gift card, in a holiday red envelope. Need some gifting help? Macy’s talented team of experts at MyStylist@Macys can always help shoppers find the perfect gifts. A fun, fast, and free service, MyStylist@Macys personal shoppers will work to understand budget and preferences and pull a selection of items that are sure to please. Give a Lunar New Year Macy’s gift card, in addition to an appointment with one of Macy’s exceptional stylists for a brilliant two gifts in one. Macy’s Lunar New Year festivities will also include tourism outreach with exclusive savings, coupons and opportunities to take advantage of gifts with purchase featuring a Lunar New Year piggy bank. For a complete listing of specific event details and additional information please visit Macy’s Lunar New Year website at macys.com/celebrate. Macy's, the largest retail brand of Macy's, Inc. (NYSE:M) delivers fashion and affordable luxury to customers at approximately 650 locations in 45 states, the District of Columbia, Puerto Rico and Guam, as well as to customers in the U.S. and more than 100 international destinations through its leading online store at macys.com. Via its stores, e-commerce site, mobile and social platforms, Macy's offers distinctive assortments including the most desired family of exclusive and fashion brands for him, her and home. Macy's is known for such epic events as Macy's 4th of July Fireworks and the Macy's Thanksgiving Day Parade, as well as spectacular fashion shows, culinary events, flower shows and celebrity appearances. Macy's flagship stores - including Herald Square in New York City, Union Square in San Francisco, State Street in Chicago, Dadeland in Miami and South Coast Plaza in southern California - are known internationally and are leading destinations for visitors. Building on a more than 150-year tradition, and with the collective support of customers and employees, Macy's helps strengthen communities by supporting local and national charities giving more than $52 million each year, plus 153,000 hours of volunteer service, to help make a difference in the lives of our customers. For Macy's media materials, including images and contacts, please visit our online pressroom at macys.com/pressroom.